Come along on a fantastic journey with the first European to visit China. 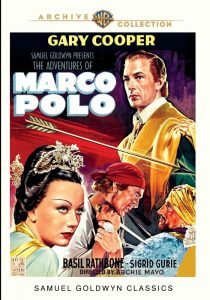 It is the Thirteenth Century, and Marco Polo (Gary Cooper) has left Venice to open trade with China, the mightiest and richest empire on Earth. Battling raging seas, the sandstorms of the Persian desert and the highest peaks of the Himalayas, Marco reaches the ancient walled city of Peking, and is welcomed by Emperor Kublai Kahn (George Barbier) and his daughter, Princess Kukachin (Sigrid Gurie). The princess falls in love with Marco, despite the fact that she has been promised to the king of Persia, and must marry him by the seventh moon. Less welcoming is the emperor’s scheming minister of state, Ahmed (Basil Rathbone). He sends Marco away on a dangerous mission to the territory of the rebellious warlord Kaidu (Alan Hale) and convinces the emperor to lead his army in an attack on japan – a battle Ahmed knows they cannot survive. Believing he has removed all obstacles, Ahmed sets his devious sights on both the princess and the throne of China. But Ahmed has underestimated Marco’s ingenious wit and considerable charm – he’s a rogue who can talk, fight or kiss his way out of any situation, and this classic action-adventure film celebrates his escapades. From his conquest of new worlds to his discovery of spaghetti, coal and gunpowder, Marco is the medieval daredevil you’ll never forget.